Arizona starting outside hitter Paige Whipple, who is second on the team in kills per set, is out this weekend due to injury. She also missed the Wildcats sweep loss last night to #14 Washington (that full match recap can be seen here). On the season, the 6’1″ sophomore from Salem, Oregon has appeared in 52 sets and notched 149 kills (2.87 per set) on a .189 mark, 110 digs (2.12 per set), 25 blocks (0.48 per set) and 3 aces. That puts her second on the team in kills and fourth in digs. According to Arizona, Whipple is out this weekend with a concussion. Their head coach, Dave Rubio, was not all too pleased with his team’s performance without her. In her most recent match, Whipple helped the team down Oregon State with 18 kills on a .515 mark last weekend. 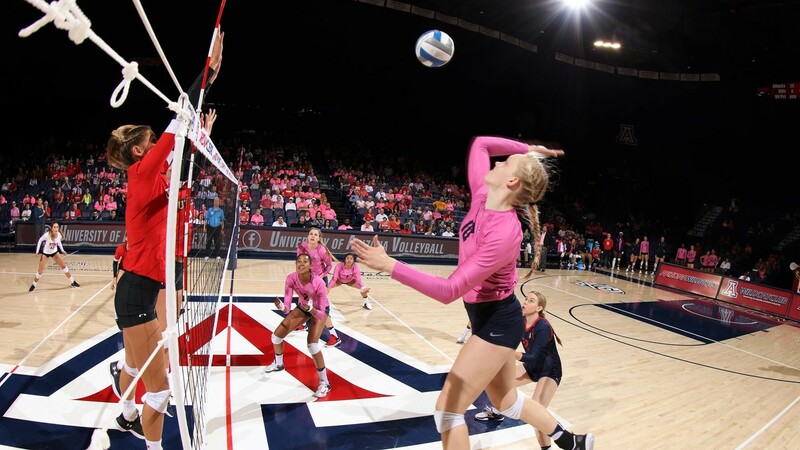 That was the encore to the Wildcats upending Oregon on the road when she had 11 kills and 15 digs. Additionally, Whipple had Umbilical Hernia Surgery this summer that forced her to play catch-up as the season began. She had seemed to more than overcome that though before suffering her latest injury. In the match against Washington, getting extended playing time without Whipple was freshman outside hitter Whittnee Nihipali. In two sets, Nihipali had two kills on a -.182 hitting percentage. She had previously seen action in 12 sets before hand. Arizona is ranked 18th in our latest VolleyMob Top 25 Power Rankings and sits at 14-3 (3-2, Pac-12) following their latest match result against Washington. Their season continues without Whipple on Sunday when they host #20 Washington State.